Oi Oi! Hello there my dears! Firstly and foremostly, I want to extend a HUGE thanks and shout-out to Meghan, who was kind enough to hit that tip jar over on the right. Thanks so much lady! I love seeing you here and on LJ, and it means so much to me to have your support. So thank you!!! And of course you know what the weekend means for us here – it’s time for comments, critiques, thoughts, support, and suggestions. So let it out! Sharing is caring! I want to know what’s on your mind, what’s making you tick, what’s suiting your fancy and what’s ticking you off. What cool events are going on in your town? What do you wish would happen? What are YOU interested in?! And in more personal news, I added some ultrasound and midwife visit pictures, here, for whoever may be interested. It’s all current as of now, and I’ll be updating every few weeks as well. 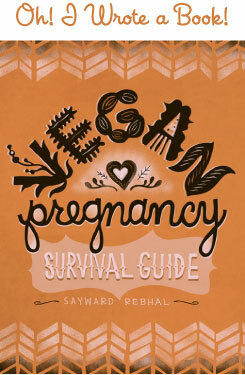 And stay tuned for the Pregnancy FAQ next week! And your final October reminders, it’s your last chance to cash in on National Co-Op Month, and National Fair Trade Month, and it’s also Vegan MoFo (that’s Vegan Month of Food). How about getting involved!? Okay, that’s all for now. Have the most wonderful weekend!!! Hey Sayward congratulations on the baby! I just found out. We finally got moved from Phoenix to the Seattle Area and I’m still unpacking. Just got my precious internets back Tuesday so I’ve been catching up on 2 weeks of blog posts. Anyway I wanted to ask you about Dr. Bronner’s Castile Soap. I have heard of people using it as both shampoo and bodywash. I tried the bar soap and it left that residue that all bar soaps seem to leave. Then I tried the liquid soap and it didn’t feel very good. I haven’t used it with a lufa yet. Do you think that will make a difference? Can you recommend a liquid soap that is environmentally friendly and good for the body that feels as luxurious as my dove body wash, or at least close? I wanted to tell you the good news, I’m finally getting myself off meat! I already don’t eat red meat so currently I’m slowly getting red of poultry and fish. I’m a bit lactose intolerant too, but I can still eat cheese, so I’m also going to get rid of all milk products. Anyways! I’m pretty good with eating meat alternatives (I love tofu, hemp hearts, etc) and I take my vitamins but I live with my parents and grandmother until I go away to university. They’re pretty nuts and now enjoy sitting and forcing me to eat red meat during dinner, it’s sort of a pain. I’ve presented them with the facts, and still nothing. And I can cook for myself too. I was wondering if you had any suggestions? Also, just for the sake of asking, I know you were a happy meat eater for a while (as in you didn’t dislike the taste or something). Do you ever crave cheese or something of the sort? I’ve never really had luck with fake meats and such, so are there good fake cheeses out there? No poo is definitely worth it! I’ve been no pooing since March. My hair is naturally curly so it frizzed out a lot for about three months. My scalp also freaked out. It was extremely oily, itchy and I started breaking out all over my face and my scalp. I’m assuming that was all the chemicals protesting. As for body wash, do you have hard water where you are? From what I can tell, liquid castile is great in soft or normal water, but really no fun in hard water areas. As far as others I’m sorry I don’t have any help – I don’t use body wash! But Seattle has tons of health food stores, so I’d find the one closest to you and go snoop around there. I’m sure they’ll have something both healthy and gentle. Good luck in the new city! @ Sara – Firstly, CONGRATULATIONS on making your way towards a meatless diet. That is a huge step and not an easy trek to make, so good for you for having the courage of your convictions. You’re going to feel so much better! Secondly, my sympathies for your family situation. I know it’s hard for so many people, especially being young and/or living at home. I always encourage people to stay in a place of compassion. Try to remember that your parents have spent your entire life making the decisions about what goes into your body. They have thought about it and cared about it and lost sleep about it when you were too tiny to even remember, and they were doing what they thought was best. As well, food is one way that a lot of parents express caring and love. A home cooked meal is a gift of labor and intention. So, regardless of how you intend it, a lot of parents take their children’s veg*nism as a personal rejection. It’s also a very clear example of your independence and self-governance as you move into adulthood – something that can be scary and sad for a parent to face. Try to keep all of this in mind as you talk to your parents about your new intentions. Try to remain sympathetic, but also stay strong. It’s important to them to see you follow through – it will really help them view you as an adult, in the long run. It will probably take time. Try to be patient (hard I know!) It WILL get easier when you are able to set out on your own. In the meantime, maybe you can involve your parents in your new diet so that they still feel a part of feeding (and ‘caring for’) you. Maybe you can all cook a vegetarian meal together. Or if you have to eat a different meal than the rest of the family, maybe there’ something else you can all do together, like game night or something. I really feel for you and I know it can be hard. I’m sorry! I promise, it gets a lot easier! Also, you rock at LJ. I don’t know how you get so deep into some of those debates without going out of your mind! I get sooo frustrated, haha. @ Salekdarling – Thanks for the awesome testimonial! That’s good to hear, and it seems like everyone goes through the transition a little differently, but everyone comes out the other side with much healthier hair. So yay! To Valerie, I use organic surge bodywash, all of their products work really well. And they’re SLS and paraben free! I live in Canada so I buy them at my drug store (Shoppers Drug Mart) but it doesn’t look like it’s sold in the US, but you can buy stuff from their website. Also thanks so much for the kind words, Sayward, I’ll keep it in mind next time I’m confronted with various animal products. Honestly, it really helped to hear I’m not the only one, haha.